Not to be confused with Al Jazeera English. Al Jazeera America (AJAM) was an American basic cable and satellite news television channel owned by the Al Jazeera Media Network. The channel was launched on August 20, 2013 to compete with CNN, HLN, MSNBC, Fox News, and in certain markets, RT America. The channel was Al Jazeera's second entry into the U.S. television market, after the launch of beIN Sport in 2012. The channel, which had persistently low ratings, announced in January 2016 that it would close on April 12, 2016, citing the "economic landscape". "Change The Way You Look At News"
"Where The News Is The Star"
The channel was headquartered and run from studios on the first floor of the Manhattan Center in New York City. It also had a total of 12 bureaus located in places such as Washington, D.C., at the channel's D.C. studios at the Newseum and Al Jazeera's D.C. hub, Chicago, Detroit, Nashville, Los Angeles, Seattle, New Orleans, Dallas, Denver, Miami, and San Francisco (former headquarters of Current TV and current headquarters of online channel AJ+). The channel was the sister channel of Al Jazeera's international English language news channel Al Jazeera English. Although operated and managed completely separately with America's management based in the United States, the two shared United States studios and bureaus such as the D.C. hub and Al Jazeera America ran some of Al Jazeera English's programming and many of its live newscasts alongside its own. 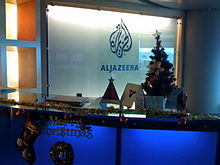 The creation of Al Jazeera America was announced on January 2, 2013, along with the announcement that the network had purchased the user generated content channel turned progressive-oriented cable television channel Current TV, which had long been struggling in the ratings and after two format changes had announced in October 2012 that it was considering a sale of the channel. It was reported that Al Jazeera planned on shutting down Current TV, keeping its production staff and possibly some programs, and using the company's distribution network to broadcast Al Jazeera America. Current TV, by coincidence, was formerly Newsworld International, an international news channel similar to Al Jazeera America run by the Canadian Broadcasting Corporation. On July 22, 2013, Al Jazeera America named former ABC News Vice President Kate O'Brian as president of the network, and Ehab Al Shihabi as interim CEO in charge of business affairs. In addition, former CNN veteran David Doss was named Vice President of News Programming and former CBS News executive Marcy McGinnis was named Vice President of News Gathering. Former MSNBC executive Shannon High-Bassalik was named Senior Vice President of Documentaries and Programs. Al Jazeera said it received more than 21,000 job applications for 400 positions at its U.S. network. Approximately 200 Current TV employees, including some 50 in editorial, were absorbed by the new operation. It planned to have a total of 800 employees at the channel's launch. Al Jazeera America also announced that the channel would employ well-known veteran journalists, anchors, and producers. On July 3, 2013, Ali Velshi confirmed that Al Jazeera America's launch would take place on August 20, 2013. The launch took place at 3:00 p.m. Eastern Time on that date, with an hour-long preview special entitled This is Al Jazeera. News coverage began immediately afterward at 4:00 p.m. Al Jazeera America's website launched on August 8, 2013. On January 14, 2016, the Al Jazeera Media Network announced that it would shut down Al Jazeera America's cable TV and digital operations on April 30, 2016, citing plummeting oil prices and the highly competitive nature of the American media market. It was also reported that this closure would lead to the loss of about 700 jobs. During its two-year history, Al Jazeera America won several media awards including the Peabody, Emmy, and Shorty Awards and citations from groups such as the National Association of Black Journalists and Native American Journalist Association. However, the network experienced low viewership ratings, averaging between 20,000 and 40,000 viewers on a typical day. Following the network's shutdown, Al Jazeera Media Network is planning on expanding its digital presence in the United States through ventures such as United States-based AJ+. On February 26, 2016, the Al Jazeera America website ceased operations. On February 11, 2016, writing in the television trade magazine, Broadcasting and Cable, industry pundit Joe Mohen proposed a provocative thesis that the business failure of Al Jazeera America was only because it chose the wrong distribution channel, namely cable. Mohen argued that by the time of Al Jazeera America's launch, the demographics of cable news viewers in the United States market were people in their 60s, whereas the natural audience of Al Jazeera was people under 34 years old; had the parent company instead launched the linear news channel as a Netflix type app, with full digital distribution, then it could have grown its audience using search, and sold its commercials programmatically. On March 27, 2016, CNN correspondents Brian Stelter and Tom Kludt wrote an in-depth analysis of Al Jazeera America's closure. Among the many reasons for the closure cited in the article were low viewership and falling oil prices. But the article also pointed to more "deeper-rooted problems." These problems included poor decision making and management on behalf of Al Jazeera higher-ups – specifically CEO Ehab Al Shihabi. The article stated that they lacked a business plan, and made faulty branding choices such as refusing to change the name "Al Jazeera." Stelter and Kludt also suggested that political issues could have played into the channel's demise. During the Bush administration, the President and other officials openly criticized Al Jazeera for airing messages from Al-Qaeda figures. This could have been part of the reason why Al Jazeera America struggled to get major cable providers like Comcast and DirecTV to carry the channel. 1800 SPECIAL: Your Stories, a six-hour retrospective presented by Antonio Mora & Richelle Carey, the duo which launched the channel on 20 August 2013. And so that's it for us here at Al Jazeera America. There are literally hundreds of people here in New York, as well as across the country and around the world, whose mission has been to give you the very best journalism. From our first moments on the air when Richelle and I welcome to you on August 20th of 2013, we've tried to bring you the stories that other news organizations don't, and we hope we have lived up to our promise to be the "voice of the voiceless" and to speak truth to power. For those of you who have supported us on-air and online, we thank you for allowing us to tell your stories. Good night, and goodbye. Following a round of applause from AJAM's staff, the channel space, in use since 1994 as Newsworld International, folded. During the time that Al Jazeera America was in existence Al Jazeera English and AJE programs that were shown on Al Jazeera America were geoblocked in the United States due to agreements with the carriers of Al Jazeera America. Programs from Al Jazeera English not shown on Al Jazeera America (such as Empire and UpFront) were some of the few unblocked during the time and therefore visible on Al Jazeera English's website. In September 2016, Al Jazeera English's online live stream and the programs which were blocked in the United States during Al Jazeera America's existence were officially un-geoblocked in the United States making them viewable for the first time since 2013. It was announced that 60% of the channel's programming would be produced in America, while an additional 40% would come from Al Jazeera English. That was later changed to almost all of the channel's program content being sourced from the United States. In an interview with The New York Times, head of international operations Ehab Al Shihabi said Al Jazeera America's content would on most days primarily concern domestic affairs. However, Shihabi added, "Al Jazeera’s seventy bureaus around the world will mean that we will have an unparalleled ability to report on important global stories that Americans are not seeing elsewhere. We will do that when it is warranted." Al Shihabi said that the channel would feature less political discussion and celebrity news and that news gathering would take priority over maximizing profits (the network was to air only six minutes of commercials per hour, a rate far less than competing networks). Its three-hour morning program was to have a different format focusing on hard news and not "a group of anchors chatting on a couch". Al Jazeera America aired live programming at all hours, including half-hour news bulletins. Three Al Jazeera English programs that were based in Washington, The Stream, Inside Story and Fault Lines were included on the launch schedule, as well as The Frost Interview and Listening Post. The flagship nighttime show was called America Tonight. It was a weeknight news magazine that presented the day’s news in Al Jazeera's long-form style with "stories that are not covered elsewhere". Al Jazeera America's original senior executive producer for news and special projects was Bob Wheelock, a former senior producer for ABC and NBC News. Wheelock left the network shortly after the launch to head up a political campaign in Delaware. CNN chief business correspondent and the anchor of Your Money, Ali Velshi was the first major name to join Al Jazeera America. He hosted a daily, half-hour show originally called Real Money with Ali Velshi, (later called Ali Velshi on Target). The show was originally going to be once a week until the end of 2013 when it was re-launched as a daily show. The channel also hired Kim Bondy, a former executive producer with CNN to produce its flagship news program America Tonight, a newsmagazine program that was hosted by original CNN International anchor and former CBS News correspondent Joie Chen, produced from Al Jazeera America's Newseum studio in Washington, D.C., and featuring correspondents Adam May, Lori Jane Gliha, former CBS, ABC and CBC news correspondent Sheila MacVicar and former Current TV correspondent Christof Putzel. The program presented in-depth segments each night on the economy, government, education, healthcare and the environment, and include breaking news stories. The program also featured work by the Al Jazeera America investigative unit and covers stories in depth from across America, revealing new insights on the news of the day and breaking stories with its own original reporting. America Tonight also incorporated social media interaction on screen and off to reflect the views of its American audience. On July 1, 2013, longtime CNN anchor Soledad O'Brien was hired to be a special correspondent for America Tonight, as well as a deal with her production company Starfish Media Group to produce long-form documentaries for Al Jazeera America. An American version of the popular Al Jazeera English program The Stream was originally featured on the channel. Produced from Al Jazeera's Washington, D.C. hub, and hosted by veteran journalist and former ABC News correspondent Lisa Fletcher. The show formatted to allow viewers to interact with Fletcher and her guests during the program via Twitter, Facebook, Google+ Hangouts and Skype. The show's social media team and second screen technology enabled viewers to engage 24 hours a day with new content, comments, user-generated videos and a variety of posts. The Stream relied heavily on a variety of online resources and social media tools to connect with people across the United States and around the world. This includes "Storify", which allowed the aggregation of additional information, links, and photos about show topics on the website; "Video Genie", which enables viewers to leave video questions for the show 24-7; and Twitter, Facebook, Pinterest, and Reddit. It also hosted Google+ Hangouts and uses Skype rather than satellite feeds for nearly all guest interviews. Less hard-news orientated than Al Jazeera America's other shows, guests included everyone from civil rights group leaders to Kathy Griffin. On July 21, 2013, the network hired former Fox News, MSNBC, and Current TV veteran David Shuster to host a show during "the evening hours". Shuster became an analyst on the midday and evening news on the channel as well as a fill in host. It later hired Andrea Stone, most recently of The Huffington Post, and Tony Karon, most recently of TIME Magazine, to manage both U.S. and global coverage for the channel's website and other digital platforms. The two were responsible for determining the overall editorial direction for the site and were based in New York City. On July 26, 2013, the network announced that former Good Morning America host and award-winning journalist Antonio Mora would host a current events talk show called Consider This, a program which showcased "hard-hitting interviews and panel discussions on issues important to American viewers". Consider This also featured interactive segments where the audience will join the conversation via social media. The first episode of the show highlighted the hunger strike and court-approved force-feeding in California's prison system. After the show's cancellation during a schedule re-do to raise ratings and lower costs Mora anchored the late news. The show was replaced by a similar program Third Rail. Kathy Davidov and Cynthia Kane were hired as the senior executive producer and senior producer for its in-house documentary film unit. Davidov came from the National Geographic Channel, where she produced shows such as Border Wars and the Explorer special. Kane came from ITVS, where she managed over 150 projects and worked with the Sundance Channel. On April 13, 2014 the channel began showing Borderland, a documentary series on illegal immigration which follows six Americans as they retrace the fatal journey of three undocumented migrants who died attempting to cross into the United States. Borderland was the first such documentary series for the channel. A second one called The System focused on the U.S. prison system. The channel had a 16-person investigative unit and hired veteran National Headline Award-winning journalist Edward Pound (formerly of The New York Times, The Wall Street Journal, USA Today, U.S. News & World Report and the National Journal) to lead its investigation division. Josh Bernstein of Denver Fox affiliate KDVR was hired as the lead investigative reporter, along with Trevor Aaronson, an award-winning author and investigative journalist and the former co-founder and associate director of the nonprofit Florida Center for Investigative Reporting who served as the networks investigative digital reporter based in Washington, D.C. This was in addition to the Al Jazeera Investigative Reporting Unit controlled by Al Jazeera English. Al Jazeera America was the first television national news outlet to report in-depth on the Flint water crisis on January 22, 2015. Al Jazeera America's news anchors included Randall Pinkston (formerly of CBS News), John Seigenthaler (formerly of NBC News and WSMV in Nashville), Antonio Mora (formerly of ABC News), Richelle Carey (formerly of CNN and HLN), Jonathan Betz (formerly of WFAA in Dallas and WWL-TV in New Orleans), Tony Harris (formerly of sister station Al Jazeera English and CNN), Del Walters (formerly of WJLA in Washington, D.C. and WMAR of Baltimore, MD) and Stephanie Sy. Mike Viqueira was hired on June 5, 2013 to be Al Jazeera America's first White House correspondent. In November 2013, Al Jazeera America hired Ray Suarez, formerly of PBS Newshour, to host Inside Story. Ali Velshi on Target (formerly Real Money with Ali Velshi) – A show hosted by Ali Velshi from New York City that focuses on current affairs which provides context and analysis around current political and economic issues along with interviews. Inside Story – Hosted by Ray Suarez from Washington D.C. Show provides analysis, background and context on the top stories of the day. Each episode features a panel of expert guests who examine and debate domestic and international topics ripped from the headlines. The Al Jazeera English version continues. America Tonight – Al Jazeera America’s flagship show, Hosted by Joie Chen from the Newseum in Washington D.C., a 30-minute-long news and current affairs magazine. Segments feature in-depth reports on subjects such as the economy, government, education, healthcare, and the environment, as well as breaking news featuring correspondents from across the country. Your World This Morning – Hosted by Stephanie Sy, Del Walters, and Nicole Mitchell (Weather) from New York City, Morning block of national and international news. News – Domestic and international News from New York City, hosted by various anchors including Tony Harris, Antonio Mora and John Seigenthaler. Talk To Al Jazeera – Interview program with prominent world figures by various anchors and journalists. Fault Lines – Hosted by Josh Rushing, Zeina Awad, and Sebastian Walker, A show that takes viewers behind a particular story and reports on it in-depth using in-depth interviews and investigative reporting. The show continues on Al Jazeera English. TechKnow – Hosted by Phil Torres and others from Los Angeles, a Fast-paced, 30-minute show that explores and exposes how the latest scientific discoveries are changing our lives. The show was taken over by Al Jazeera English after shutdown. Compass With Sheila Macvicar – Hosted by Sheila MacVicar, program focuses on foreign policy issues. Third Rail – Hosted by Ali Velshi (formerly Imran Garda), weekly current affairs program tackling controversial issues and probe perspectives with moderated debate, three-person panels and reports from Al Jazeera correspondents around the world. Al Jazeera America Presents – Documentary and investigative series focused on a specific topic such as Borderland and The System. Consider This – Weeknight current affairs talk show with Antonio Mora from New York City. Show featured interviews with prominent newsmakers, panel discussions that provide insight through varied perspectives and involvement of the show’s audience using social media. Power Politics – Hosted by David Shuster from New York City, a political analysis show featuring in-depth looks into issues topping the poles (produced during U.S. election seasons). The Stream (American Version) – Hosted by Lisa Fletcher and Wajahat Ali from Washington, D.C., Current events discussion and debate show formatted to allow viewers to interact with the hosts and guests during the program via Twitter, Facebook, Google+ Hangouts and Skype. The Al Jazeera English version continues. Newshour — an hour of world news and sport hosted from both of Al Jazeera English's broadcast centres in Doha and London. Listening Post – Hosted by Richard Gizbert from London, Current affairs program that critiques journalism and the media industry around the world. People & Power — a biweekly program, originally hosted by Shereen El Feki. The Frost Interview (previously Frost Over The World) was hosted by David Frost. Frost died in 2013, and show still aired posthumously with the family's consent. The Truth Is... – series imported from Australia. Also airing at various times were the Al Jazeera English programs Earthrise, Al Jazeera World and Al Jazeera Correspondent along with shows brought in from other channels in the UK and Australia. A complete list of hosts and correspondents is located in the box at the bottom. In 2014, Al Jazeera America and producer Reed Lindsay won a Gracie Award in the "Outstanding Hard News Feature" category from the Alliance for Women in Media Foundation for the story “Fists of Fury,” which aired on America Tonight. The award was the first award ever for the channel. Al Jazeera America also won a Shorty Award for "Best News Twitter Account". The Al Jazeera America show Fault Lines won two Peabody Awards in 2013 for the episodes "Haiti in a Time of Cholera" and "Made in Bangladesh". The channel and Fault Lines also won a Robert F. Kennedy Journalism Award for "Made in Bangladesh". On September 30, 2014, Fault Lines won a News & Documentary Emmy Award in the Investigative Journalism News-magazine category for "Haiti in a Time of Cholera". In early 2015, Al Jazeera America's digital team was recognized with an Award of Excellence for Photo Editing Portfolio in the Pictures of the Year International competition. In April 2015, Al Jazeera America won 16 National Headliner Awards including 7 first place wins in various categories including "Broadcast television networks, cable networks and syndicators environmental reporting" where It held all three top nomination spots with the Fault Lines episode “Water for Coal” winning overall, "Broadcast television networks, cable networks and syndicators investigative report" and "Best of TV" where the Fault Lines episode "Deadly Force" won, "Broadcast television networks, cable networks and syndicators documentary or series of reports" where the documentary "Killing the Messenger" won, "Broadcast television networks, cable networks and syndicators coverage of a major news event" where they also held the top three places with their coverage of "The Downing of MH14" winning, "Broadcast television networks, cable networks and syndicators newscast" where their coverage of the "Crisis in Yemen" and "ISIL on the Turkish Border" won and "online slideshow" for its digital team. While covering the Ferguson protests in 2014, officers from the Ferguson Police Department shot rubber bullets and tear gas at an AJAM news crew including correspondent Ash-har Quraishi, who after yelling, "We're the press" caused them to abandon their recording equipment and run to safety. The incident was caught on camera by KSDK-TV, a local NBC affiliate who was filming from across the street. An officer was captured on video turning the reporters' video camera toward the ground and dismantling their equipment. Other incidents, including the arrests of two print journalists for The Washington Post and The Huffington Post, also occurred during the same time period. On April 28, 2015, Matthew Luke, Al Jazeera America's former Supervisor of Media and Archive Management, filed a US$15 million lawsuit against his former employers over unfair dismissal. Luke alleged that he had been unfairly dismissed by the network after he had raised concerns with the human resource division that his boss, Osman Mahmud, the Senior Vice-President of Broadcast Operations and Technology, discriminated against female employees and made anti-Semitic remarks. In response, Ehab Al Shihabi, the head of Al Jazeera America, has announced that the network will contest the lawsuit in court. Mahmud has also denied Luke's charges and has alleged that Luke was a difficult employee. In an unrelated development, two female Al Jazeera America employees—Diana Lee, the Executive Vice-President for Human Resources, and Dawn Bridges, the Executive Vice President for Communications, had resigned that week. On May 4, 2015, Marcy McGinnis, a senior Al Jazeera America's executive and former CBS news anchor, resigned from the company for undisclosed reasons amidst internal dissension with AJAM's management. On May 5, 2015, Al Jazeera Media Network demoted Al Shihabi to Chief Operations Officer (COO) of Al Jazeera America. He was demoted from CEO after a report from the New York Times of an altercation between him and host Ali Velshi where he attempted to fire and sue the channel's top host. He was replaced by Al Anstey, the former managing director of Al Jazeera English. On June 11, 2015, Shannon High-Bassalik, AJAM's former senior vice president of programming and documentaries, filed a multi-million lawsuit against the channel; alleging a biased pro-Arab coverage and the mistreatment of employees. AJAM has responded that they would contest the lawsuit in court. On November 8, 2015, it was reported that Al Jazeera America's general counsel, David W. Harleston, did not have a license to practice law. Harleston had previously dealt with several lawsuits involving DirecTV and Al Gore, several wrongful termination cases by former employees, and the departure of the company's chief executive, Al Shihabi. On December 27, 2015, Al Jazeera English released a report aired on Al Jazeera America conducted by the Al Jazeera Investigative Unit via Al Jazeera Investigates called "The Dark Side: Secrets of the Sports Dopers" which investigated professional athletes' potential use of Performance-enhancing drugs (PEDs) naming Peyton Manning and other prominent athletes, as having received drugs from Charles Sly, a pharmacist who had worked at the Guyer Anti-Aging Clinic in Indianapolis during the fall of 2011. The Huffington Post leaked the reports a day before Al Jazeera's publication. Then, Manning told ESPN's Lisa Salters about the reports, despite the fact that the documentary had not yet been aired, in an interview on the morning of the 27th for ESPN Sunday NFL Countdown calling them "completely fabricated" and "garbage". He also expressed his anger that his wife, Ashley, had been mentioned in the documentary. Salters pointed to other cases in which athletes initially deny, and then eventually admit allegations, but Manning replied that he could not speak for others. Nevertheless, Manning also stated he had visited the Guyer Institute 35 times during 2011 and that he had received both medication and treatment from Guyer during this time. Sly recanted his story and requested the report not to be aired via a YouTube video following the release of the report. Sly later said he had never seen the Mannings and told ESPN's Chris Mortensen that he is not a pharmacist and was not at the Guyer Institute in 2011, as Al Jazeera claimed. However, state licensing records indicate that someone named "Charles David Sly" was licensed as a pharmacy intern in Indiana from April 2010 to May 2013 and that his license expired May 1, 2013. Manning decided to respond to the further allegations against him, and hired former George W. Bush press secretary Ari Fleischer to manage the issue. He also threatened to sue Al Jazeera but then decided against doing so. On January 5, 2016 it was announced that Ryan Howard and Ryan Zimmerman had filed a lawsuit suing Al Jazeera for defamation following the publication's release of the documentary which linked them. ^ Farhi, Paul (January 13, 2016). "Al Jazeera America news channel to close up shop". Washington Post. Retrieved January 13, 2016. ^ "Al Jazeera America to Shut Down". The Hollywood Reporter. Retrieved January 13, 2016. ^ "Manhattan Center Announces Al Jazeera America as Its Newest Television Studio Client". Yahoo!. August 20, 2013. Archived from the original on April 22, 2014. Retrieved August 22, 2013. ^ a b c Pompeo, Joe (July 11, 2013). "Al Jazeera America: A Unicorn Is Born". New York Magazine. Retrieved July 12, 2013. ^ Brown, Hagey (March 10, 2013). "Al Jazeera in Site Hunt". Wall Street Journal. Retrieved August 2, 2013. ^ Guthrie, Marisa (July 18, 2013). "Al Jazeera America: Can Oil Money Buy Relevance for the Controversial Network?". Hollywood Reporter. Retrieved October 26, 2015. ^ Enda, Jodi; Guskin, Emily (May 28, 2013). "Al Jazeera America's biggest challenge: 'getting people to show up'". Pew Research Center. Retrieved August 20, 2013. ^ Zeidler, Sue; Baker, Liana (January 3, 2013). "Al Jazeera buys Gore's Current TV, terms undisclosed". Reuters. Retrieved January 3, 2013. ^ Riley, Charles (January 3, 2013). "Al Jazeera buys Current TV, will launch new channel". CNN. Retrieved January 3, 2013. ^ "ABC News Veteran Kate O'Brian Named President of Al Jazeera America – TVNewser". Mediabistro.com. July 22, 2013. Retrieved July 15, 2014. ^ Miner, Michael (February 20, 2013). "Al Jazeera America is hiring". Chicago Reader. Retrieved July 12, 2013. ^ Weprin, Alex (July 3, 2013). "Al Jazeera America Launching August 20". TV Newser. Retrieved July 11, 2013. ^ Harris, Malcolm (June 23, 2014). "Fact-Based, In-Depth News | Al Jazeera America". America.aljazeera.com. Archived from the original on July 15, 2014. Retrieved July 15, 2014. ^ "Al Jazeera America to close down". Al Jazeera America. January 14, 2015. Retrieved January 14, 2015. ^ Kludt, Tom; Stelter, Brian (January 14, 2016). "Al Jazeera America to shut down in April". CNN Money. Retrieved January 14, 2016. ^ "Al Jazeera America to expand digital operations in the US". Al Jazeera. January 14, 2015. Retrieved January 14, 2015. ^ Koblin, John (January 13, 2016). "Al Jazeera America to Shut Down by April". New York Times. Retrieved January 13, 2016. ^ Karon, Tony (February 26, 2016). "Al Jazeera America says Goodbye". Big News Network. Retrieved February 26, 2016. ^ Mohen, Joe (February 11, 2016). "Al Jazeera America Shutdown Proves Flawed Strategy Always Undermines Great Execution". Broadcasting and Cable. New York: New Bay Media. ^ Sullivan, Kevin; Pincus, Walter (November 23, 2005). "Paper Says Bush Talked of Bombing Arab TV Network". The Washington Post. ISSN 0190-8286. Retrieved March 30, 2016. ^ Stelter, Brian; Kludt, Tom. "The final days of Al Jazeera America". CNNMoney. Retrieved March 30, 2016. ^ "Schedule". america.aljazeera.com. Retrieved February 28, 2019. ^ Brian Stelter (May 26, 2013). "Al Jazeera America Shifts Focus to U.S. News". New York Times. ^ Flint, Joe (June 11, 2013). "Al Jazeera America promises less political chat and celebrity news". Los Angeles Times. Retrieved July 12, 2013. ^ Malone, Michael (August 15, 2013). "Al Jazeera America Execs Preview New Network With 'Less Yelling, Fewer Celebrities'". Broadcasting & Cable. Retrieved August 22, 2013. ^ Weprin, Alex (June 11, 2013). "Al Jazeera America To Launch In August, With Fewer Commercials Than Competitors". Media Bistro. Retrieved July 12, 2013. ^ Stelter, Brian (May 26, 2013). "Al Jazeera America Shifts Focus to U.S. News". New York Times. Retrieved July 12, 2013. ^ "Meet the Team – Senior Executive Producer for Business Programming John Meehan". Al Jazeera America. Retrieved July 12, 2013. ^ Weinger, Mackenzie (April 4, 2013). "Ali Velshi Joins Al Jazeera America". Politico. Retrieved July 12, 2013. ^ Byers, Dylan (July 23, 2013). "Joie Chen to host Al Jazeera America's 'America Tonight'". Politico. Retrieved August 22, 2013. ^ "Al Jazeera America will broadcast nightly primetime current affairs magazine". Al Jazeera America. Archived from the original on June 23, 2013. Retrieved June 19, 2013. ^ "Al Jazeera America names Sheila MacVicar correspondent for America Tonight | Al Jazeera America". America.aljazeera.com. July 15, 2013. Archived from the original on July 19, 2013. Retrieved July 15, 2014. ^ Mirkinson, Jack (July 1, 2013). "Soledad O'Brien Becomes Al Jazeera America Correspondent". Huffington Post. Retrieved July 12, 2013. ^ "'The Stream' to Join Al Jazeera America's Daily Program Lineup". Al Jazeera America. June 19, 2013. Archived from the original on June 21, 2013. ^ Calderone, Michael (July 21, 2013). "David Shuster Joining Al Jazeera America: Source". The Huffington Post. Retrieved August 21, 2013. ^ "Andrea Stone and Tony Karon to Join Al Jazeera America". Al Jazeera America. Archived from the original on May 7, 2013. Retrieved July 12, 2013. ^ "Antonio Mora joins Al Jazeera America as host of "Consider This" | Al Jazeera America". America.aljazeera.com. July 26, 2013. Archived from the original on July 31, 2013. Retrieved July 15, 2014. ^ "Al Jazeera America Announces Plans to Produce and Acquire Documentaries|Filmmakers,FilmIndustry,FilmFestivals, Awards & Movie Reviews". Indiewire. October 26, 2012. Retrieved July 15, 2014. ^ Weprin, Alex (June 10, 2013). "Josh Bernstein Tapped As Investigative Reporter For Al Jazeera America". Media Bistro. Retrieved July 12, 2013. ^ "Al Jazeera America names Trevor Aaronson to 16-member investigative unit | Al Jazeera America". America.aljazeera.com. July 24, 2013. Retrieved July 15, 2014. ^ Molloy, Tim (July 11, 2013). "Al Jazeera America Names 4 Anchors". The Wrap. Retrieved July 12, 2013. ^ Weprin, Alex (June 5, 2013). "NBC's Mike Viqueira Named White House Correspondent For Al Jazeera America". Media Bistro. Retrieved July 12, 2013. ^ "Al Jazeera America to Expand Live Newscasts… – Inside Cable News". Inside Cable News. Retrieved May 17, 2015. ^ Marechal, Al (August 14, 2013). "Al Jazeera America Announces Programming Schedule". Variety. Retrieved June 29, 2014. ^ "Fact-Based, In-Depth News Fills Al Jazeera America's Programming". Al Jazeera America. August 14, 2013. Retrieved June 29, 2014. ^ "Al Jazeera America Wins First Award | Inside Cable News". Insidecablenews.wordpress.com. February 19, 2014. Retrieved July 15, 2014. ^ "Shorty Awards Winners Announced". Deadline.com. Retrieved July 15, 2014. ^ "Announcing the 2014 Robert F. Kennedy Book & Journalism Award Honorees | Robert F. Kennedy Center for Justice & Human Rights | Robert F. Kennedy Center for Justice & Human Rights". Rfkcenter.org. Archived from the original on July 22, 2014. Retrieved July 15, 2014. ^ "Award of Excellence – Editing Portfolio – Magazine". poyi.org. Retrieved May 17, 2015. ^ Taibi, Catherine (August 14, 2014). "Ferguson Police Use Tear Gas On Al Jazeera America Team". Huffington Post. Retrieved August 16, 2014. ^ Casey Nolen, KSDK (August 14, 2014). "TV crews hit by bean bags, tear gas". KSDK. Retrieved May 17, 2015. ^ "Ferguson-related charges dropped against Washington Post and Huffington Post reporters". Washington Post. Retrieved July 6, 2018. ^ Matthew Luke versus Al Jazeera America and Osman Mahmud (PDF) (Report). Deadline.com. NYSCEF Doc. No. 2. Retrieved May 10, 2015. ^ Brian Flood (April 28, 2015). "Fired Al Jazeera America Employee Seeks $15 Million in Lawsuit". TVNewser. Retrieved May 8, 2015. ^ Brian Flood (April 29, 2015). "Former Al Jazeera America employee claims he was fired after complaining about sexism, anti-Semitism". nydailynews.com. New York Daily News. Retrieved May 8, 2015. ^ Kludt, Tom (April 30, 2015). "Al Jazeera America exec tells staff that he will fight lawsuit". CNN Money. Retrieved May 1, 2015. ^ Steinberg, Brian (May 4, 2015). "Marcy McGinnis, Senior Al Jazeera America Executive, Leaves Network". Variety.com. Retrieved May 8, 2015. ^ Hadas Gold. "Al Jazeera America appoints new CEO". POLITICO. Retrieved May 17, 2015. ^ Bond, Shannon (May 8, 2015). "Al Jazeera America: Qatar's ambitions struggle on US screens". Financial Times. Retrieved May 8, 2015. ^ "Al Jazeera America abandoned 'journalistic objectivity,' new suit claims". CNNMoney. June 11, 2015. Retrieved July 13, 2015. ^ Runyeon, Frank; Koblin, John (November 8, 2016). "General Counsel for Al Jazeera America Appears to Be Unlicensed". New York Times. Retrieved January 14, 2016. ^ "Documentary links Peyton Manning, other pro athletes to use of PEDs". ESPN.com. May 1, 2013. Retrieved December 29, 2015. ^ "Al Jazeera reporter stresses that no allegation is being made against Peyton Manning | ProFootballTalk". Pro Football Talk. Retrieved February 8, 2016. ^ "Explosive Documentary Links Peyton Manning, Major Athletes To Doping Ring". The Huffington Post. Retrieved May 6, 2016. ^ "Transcript: Peyton Manning interviews with ESPN's Lisa Salters". Denverbroncos.com. Retrieved December 29, 2015. ^ Sports. "Charlie Sly recants statements about Peyton Manning". Business Insider. Retrieved December 29, 2015. ^ Cleary, Tom. "Charlie Sly: 5 Fast Facts You Need to Know". Heavy.com. Retrieved December 29, 2015. ^ "Documentary links Peyton Manning, other pro athletes to use of PEDs". WABC-TV. May 1, 2013. Retrieved December 29, 2015. ^ "Report: Peyton Manning turns to Ari Fleischer in wake of HGH doc". CBSSports.com. Retrieved May 6, 2016. ^ "Ryan Zimmerman, Ryan Howard suing Al Jazeera after steroid story". Yahoo Sports. CNN Money: The Final Days of Al Jazeera America, Profile on the channel told by staffers and ex-staffers.